This is a great question! The American Academy of Pediatric Dentistry (AAPD) recommends that a child’s first dental visit occur around the time of the eruption of the first tooth, but no later than the child’s first birthday. Dentists aren’t only looking for cavities at a first dental visit. At a child’s first dental visit, our pediatric dentists are providing a comprehensive examination of the structures of the head, neck and mouth including assessment of the developing bite, provide proper oral hygiene counseling, assess and provide dietary counseling including the appropriateness of feeding practices—bottle and breastfeeding, remove hard (calculus) and soft (plaque) deposits from the teeth, assess and prescribe a fluoride regimen, provide injury counseling, provide oral habit counseling, determine and discuss intervals for future dental visits, determine and discuss treatment if needed, and complete a risk assessment for the development of cavities. The AAPD also recommends that parents/guardians try to establish a “dental home” for their child as early as possible. A “dental home” is the ongoing relationship between the dentist and the patient which includes the coordination and delivery of all aspects of oral health care. Just as a child establishes a “medical home” with a pediatrician, it is important to establish a “dental home” with a pediatric dentist so that dental care can be provided in a comprehensive and continuous manner to help maximize oral health. Parents shouldn’t worry when they bring their little one in for their first dental examination. Even though a child is young, our doctors spend extra time with every little one to show and explain how their first dental exam will occur. 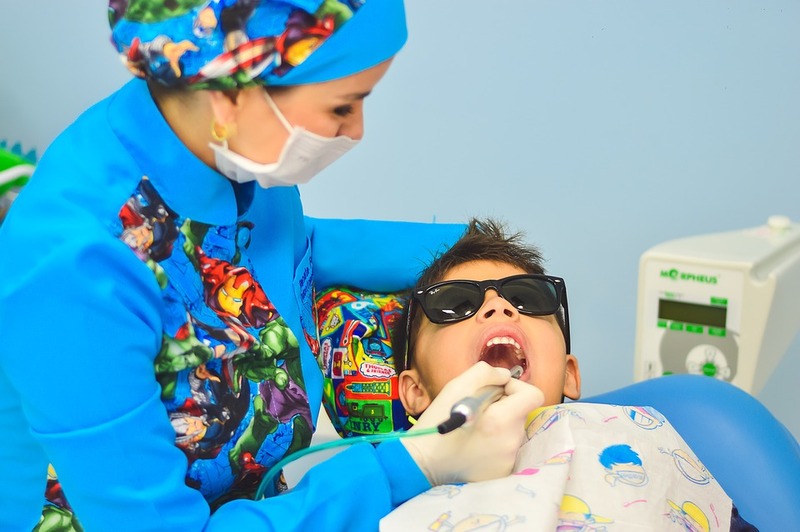 When a child is too little or young to cooperate for a dental examination and cleaning in the dental chair, the examination and cleaning will be performed in a knee to knee position with the child on the parent’s lap, where he/she is most comfortable. If your child is a little older and has never seen a dentist, it’s never too late to bring him/her in for their first dental visit.